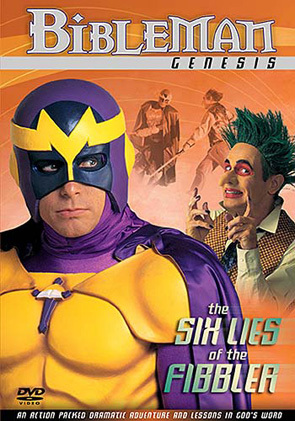 “Six Lies of the Fibbler” is the third episode of the original Bibleman series, “The Bibleman Show.” Willie Aames wrote, produced, and co-directed “Six Lies of the Fibbler,” while also portraying the lead character of Bibleman. Chris Fann again co-directs, but Milt Schaffer and C. Scott Votaw are notably absent from the credits, and Tony Salerno is relegated to solely receiving creation credit for the episode. There is definitely a quality difference between the first two episodes and “Fibbler” that makes me wonder if there was some change in personnel and direction behind the scenes, which might explain a lot. “Six Lies of the Fibbler” is once again a musical, as all of the original “The Bibleman Show” episodes appear to be. The introductory song is something like “Bible Vision,” which sounds like a useless power that Bibleman might actually have. The music certainly hasn’t gotten any better from the first two episodes, and the increase in necessary dramatic acting on the children’s parts results in a product that is hilariously awful, more so than the first two entries in the series. The villain of “Six Lies of the Fibbler” is, of course, The Fibbler: a damn creepy orange clown who hypnotizes children into lying through the use of some sort of magic dust. The Fibbler is definitely the most ridiculous and over the top villain on the show thus far, and is genuinely a bit unsettling, particularly thanks to the makeup work (which is reminiscent of The Joker). 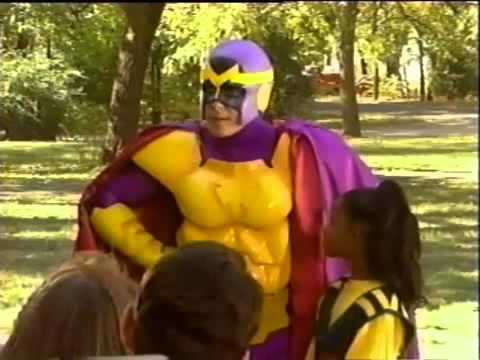 I will note that for the first time in the series, the villain actually interacts with the kids, rather than just going after Bibleman. This does liven things up a little bit, and gives the villain character some badly needed additional screen time in comparison to the first two episodes. “Six Lies of the Fibbler” introduces a lot of elements that pop up a bunch later on in the series, including Bibleman’s laser sword, the recitation of bible verses while fighting, and a bible lair, which becomes a key set and base of operations later on. The story of “Six Lies of the Fibbler” once again follows the same children’s musical group from “Big Big Book” and “Back to School,” but this time there is unrest within their ranks. 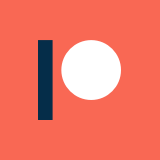 Their youngest member is influenced by a villain named The Fibbler into compulsively lying to her friends, which drives a wedge into the musical group. Bibleman eventually figures out what is going on, and helps bring the group back together. One of my big issues with the plot of “Six Lies of the Fibbler” is that the kid was drugged into lying, but it still forced to apologize for her actions while under the effects of The Fibbler’s drugs. The other kids forgive her, but was it ever really her fault? She was a victim, and forced into lying to the group. It is also notable that Bibleman knows that this is the case, but never tells the girl that she was being manipulated by a villain with mysterious chemicals. Way to go, Bibleman. Speaking of the villain, The Fibbler straight up explodes after his fight with Bibleman, starting a trend of brutal villain deaths that continues throughout the series. Bibleman doesn’t directly kill him, but something tells me that he doesn’t have a non-lethal code of ethics. I’ve read enough of the bible to know that. 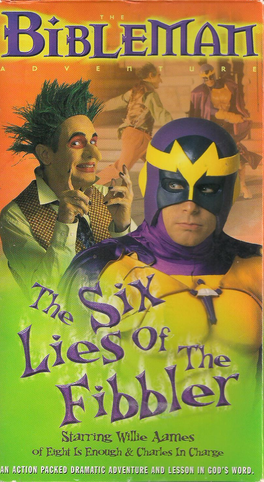 “Six Lies of the Fibbler” is actually an episode of “Bibleman” that I would recommend. The villain is ridiculous, the story doesn’t make sense, the acting is awful, and the series is still young enough that all of the costumes and props are incredibly cheap. Even the musical numbers are arguably baffling enough to justify sitting through, though that is definitely up for debate. 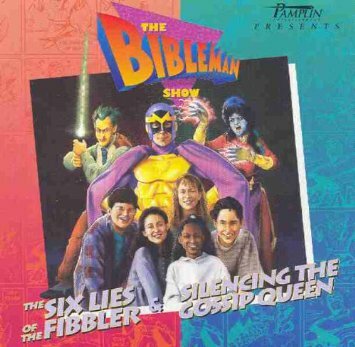 If you are looking for an introduction to the world of Bibleman, “Six Lies of the Fibbler” is a good place to start.